Enerlites HET06-R can help save you money while adding a level of convenience and energy saving to your home. 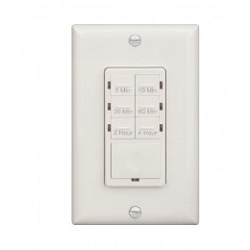 This Enerlites preset timer switch has the flexibility time adjustment from 5, 10, 30, 60 minutes and 2, to 4 hours. This unit works with incandescent, fluorescent lamb and fan motor; ideal for closet, pantry, garage, laundry room, basement, outdoor lighting, and home spas.